Alan and I had talked for years about re-creating our honeymoon trip during which we tent-camped our way across the country to visit a number of grand and glorious National Parks and Monuments in the west. We wanted to share that same adventure with the kids and, in the summer of 2007, we did just that. Instead of a two man mountain tent, we slept in our travel trailer, but aside from that concession to our formerly youthful bodies, the adventure was much the same. We hit all the same National Parks – Mount Rushmore, Devil’s Tower, Glacier, Yellowstone, Grand Teton and Rocky Mountain - picnicked at mountain lakes, hiked some of the same trails we had taken 28 years ago and saw the awe on the faces of our children as we introduced them to America. In my previous post in this series, I had mentioned a scavenger hunt on which we had dragged the kids along. I wouldn’t be able to share this story with you if I didn’t take you back in time to a cold September night in West Yellowstone 28 years prior to this trip . . . 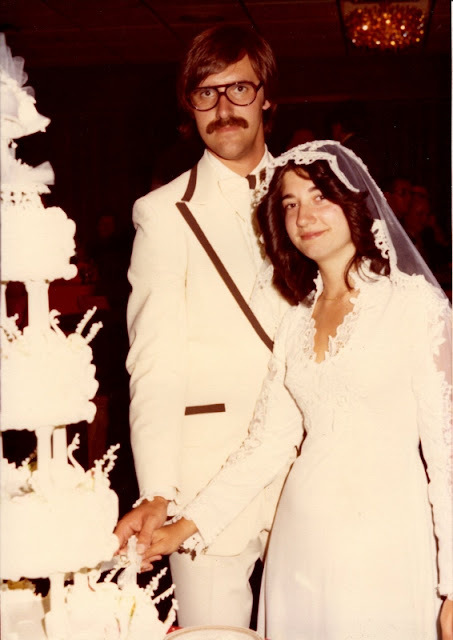 It was coming up on late September in 1979 when we settled in at the KOA in West Yellowstone Montana - two crazy kids from the east coast, newlywed and on the adventure of our young lives. The happy couple! Oh, wait! Wrong photo! Right photo! Check out those lapels, circa 1979 . . .
A two person mountain tent was all that was between us and the elements, but we had been fortunate weather-wise with t-shirt weather during the fall days and cool, but not cold, temperatures at night. All that changed on our last night in West Yellowstone. When I woke up, it was around 5:00 a.m., dark, and I was alone. Alone, but not worried. 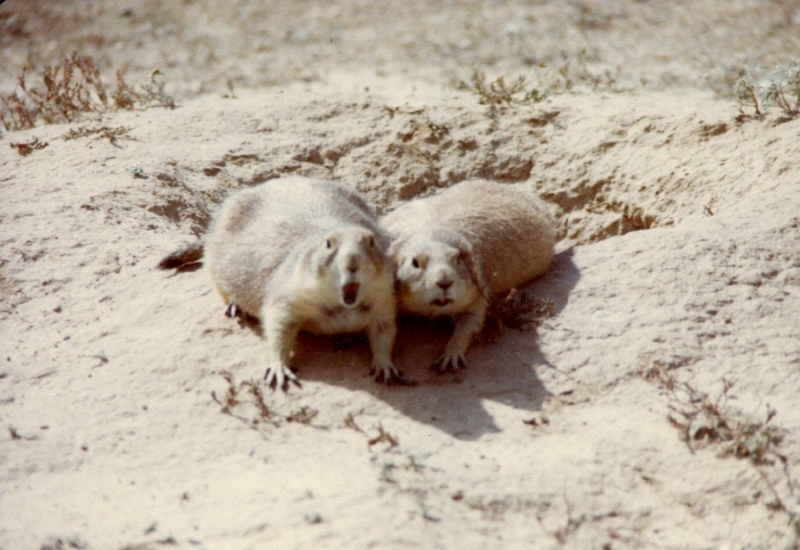 Alan had most likely made a restroom run and would return soon. But, despite our heavy-weight sleeping bags, I was cold and becoming colder by the minute. Where the heck was Alan? Was he okay? Maybe he was sick. But it sure was cold. Too cold to stay there much longer so I pulled on my jacket and hiking boots and stepped outside the tent. Well, I found out why I was cold. Ice was caked all over the tent. I didn’t know how low the temperature dropped during the night and I was pretty sure I didn’t want to find out. No matter what Alan’s situation was, there was no way I was going to crawl back into that tent and try to sleep. In almost no time at all, I had the sleeping bags rolled up and our gear packed. I knocked the ice off the tent and packed that up, too. Alan still wasn’t back and, by this time, I was getting more annoyed than worried. I figured he was warming up in the men’s room while I was doing all the work out in the frigid morning air. Time to find him and drag him out of there and back into the real world. When I approached the restrooms, I could hear men’s voices. Really? At 5:00 a.m.? It was probably some other poor, freezing soul and the two guys had gotten into a conversation. When I called to Alan, he came out almost immediately. As it turned out, he had gotten up to use the restroom and had run into a guy from a town just 12 miles away from where we lived. “Fate” and “coincidence” are two pretty powerful words in my dictionary and that’s where I’ll leave it. At 5:00 a.m. on a cold September morning in the tiny town of West Yellowstone, Montana - over 2,000 miles from home - Alan ran into someone who lived 20 minutes from our house. Sometimes, life is just a little difficult to comprehend. Well, I had Alan back and he suggested making some coffee and getting breakfast going. Hmmm. Couldn’t do that as everything (and I do mean everything) was already packed and I was ready to go. We needed to find someplace serving breakfast and a lot of hot coffee. I’m not sure what time we reached town but, let’s just say that before sunrise on a fall morning, there is not much happening in West Yellowstone. We drove up and down every street in the tiny town, searching for an open restaurant. Finally, we spotted a rustic café that was just about ready to open its doors for the day. The interior lights were a beacon to us, promising comfort (at last!) and a hot breakfast. We waited in the car with the engine running trying to warm up. Then, finally, it was time. The café was western-themed; the servers were all dressed in blue jeans and work shirts, with cowboy boots and hats. The coffee was hot, perfect and kept on coming. 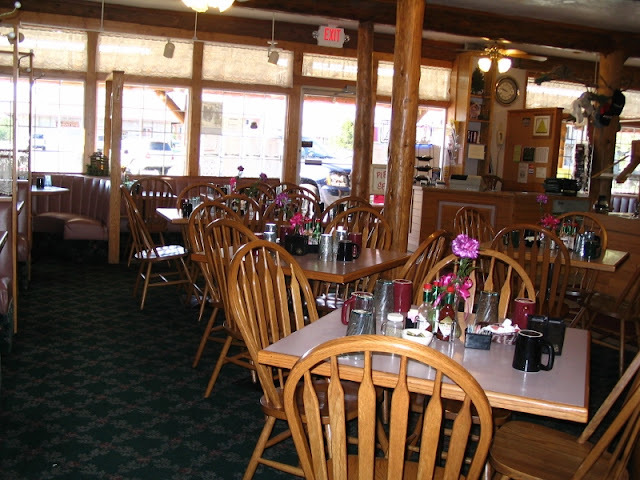 The blueberry muffins were to die for and the breakfast – whether in actuality or simply because we were in such dire straits, I’m not sure – is fondly remembered as one of the best meals I’ve ever had. Did I mention how delicious the blueberry muffins were? With the warmth seeping back into our bones and a road trip ahead of us, we left the cowboys to their customers and headed out into the streets of West Yellowstone. Alan and I always figured that this little eatery saved our bacon while we ate theirs. That was the backstory. Fast forward 28 years. What if there was a chance we could find that restaurant and enjoy a meal there for old time’s sake? How hard could it be to find one particular restaurant in such a small town? Alan and I decided that we had to look. Our son and daughter (ages 13 and 8, respectively, at the time) thought we were crazy as we dragged them up one street and down the other. Neither Alan nor I remembered the name of the restaurant and we had no idea what street it was on, so we asked various shopkeepers and sales clerks for help along the way. 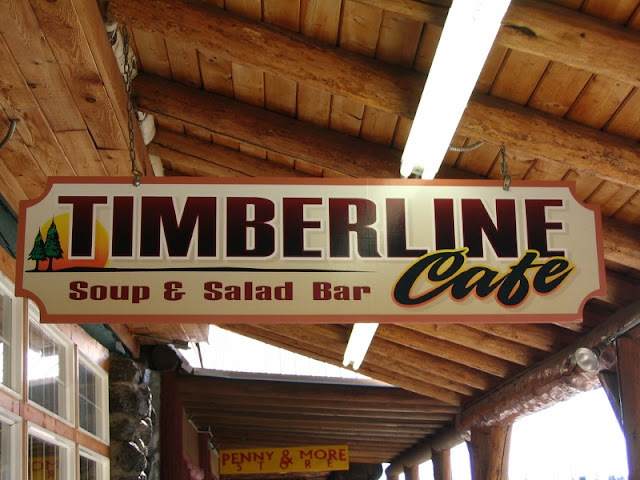 Finally, someone suggested we try the Timberline, as it had been open for many years. Guess what?! We found it!!! The Timberline Café at 135 Yellowstone Avenue had undergone a renaissance of sorts. Yes, this was definitely it! Still warm and welcoming, too! Gone was the western-themed decor and I can only assume that the “cowboys” were sent back to the ranch. In its place was a lovely Scandinavian-styled interior with smiling young women who welcomed us to an early lunch. Were we sure it was the same place? Absolutely, there wasn’t a doubt in our minds. 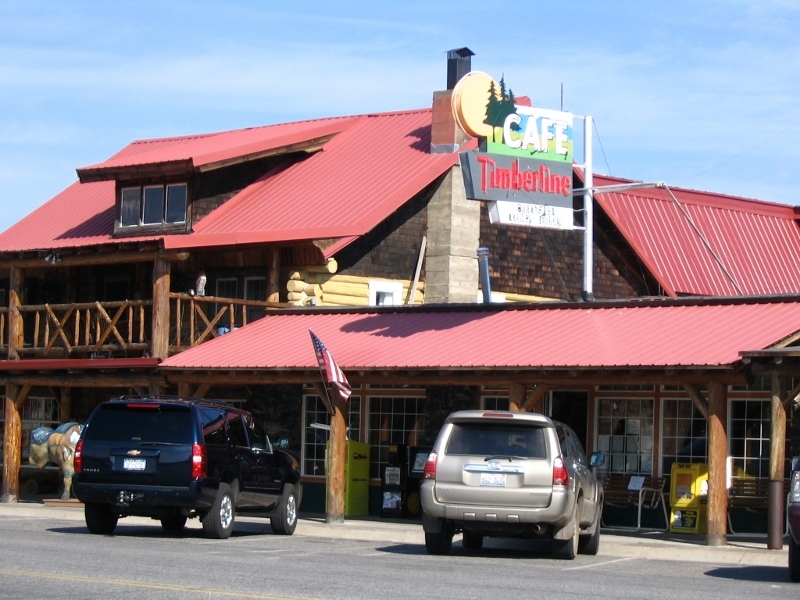 As it turned out, the Timberline Café was built next to the historic Madison Hotel in the early 1900’s and it has been in operation since then. Not only did we have another wonderful meal there, but the staff graciously allowed us to take as many photos as we wanted after hearing the story of our scavenger hunt. 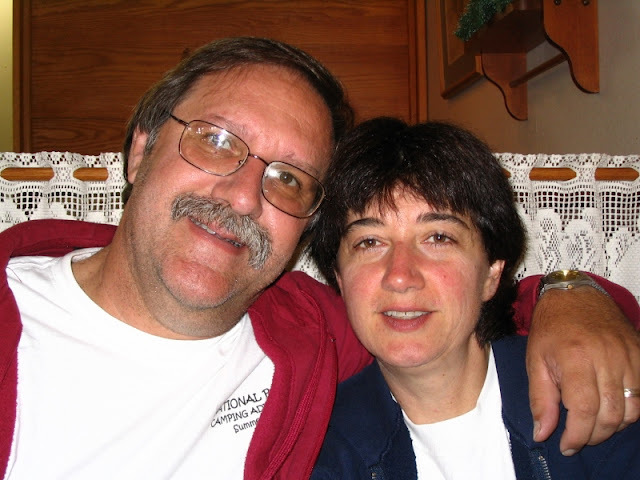 The older newlyweds - life is good at the Timberline Cafe! There may have been 28 years between visits, but the Timberline treated these hungry travelers as well in 2007 as it did back in 1979. Truth be told, I don’t think I want to wait another 28 years to go back. Postscript: While on our unusual scavenger hunt, we were enjoying the many painted bison that decorated the streets of West Yellowstone. I found out later that the “Buffalo Roam” Art Project was created back in 2006 by the West Yellowstone Economic Development Committee (WYED). Less than two months before our family visited in 2007, 26 fiberglass bison that had been painted in various themes by different artists were placed around the town. A year later, 10 painted calves were added to the landscape. In August of 2009, every one of the 36 works of art were auctioned off, earning over $161,000 for WYED and its community projects. Although most of the bison were taken elsewhere after the auction, I understand that there are still at least a dozen in West Yellowstone that can be viewed by visitors. That was a bonus story; there’s no need to thank me. If you plan to visit Yellowstone National Park and find yourself near West Yellowstone and in need of sustenance, I believe you’ll find a warm welcome at the Timberline Café (link HERE). Let me know how the blueberry muffins are.